Hal Leonard Fake Books. Disney. Fakebook (spiral bound). With vocal melody, lyrics and chord names. 288 pages. Published by Hal Leonard (HL.240039). 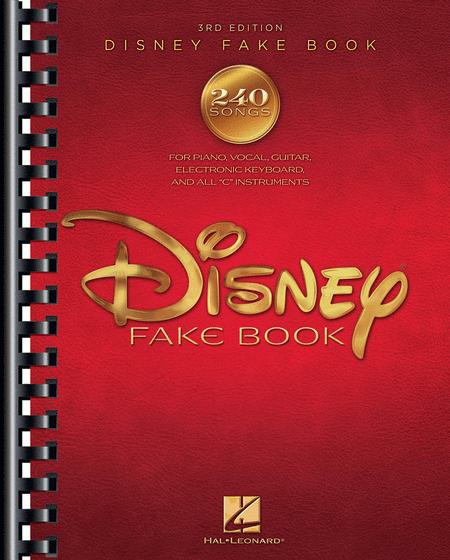 This third edition features even more Disney favorites, including hits from their most recent movie and television releases. 240 songs in all, including: Almost There • Be Our Guest • Beyond My Wildest Dreams • Breaking Free • Circle of Life • The Climb • A Dream Is a Wish Your Heart Makes • Hoedown Throwdown • If I Didn't Have You • King of New York • Kiss the Girl • Rock Star • Some Day My Prince Will Come • A Spoonful of Sugar • That's How You Know • We're All in This Together • When You Wish Upon A Star • You Are the Music in Me • and more. This book has been great fun and has brought back great memories. I find the songs easy to play. I'm thrilled with the title selections. A great buy. Thank you Sheet Music Plus! It is terrific. I bought it as a present for my teenage daughter who sings, and she was thrilled with the updated additions. Very current! 24 of 50 people found this review helpful. singing our hearts out. What more could you ask of a fake book? 33 of 72 people found this review helpful. to hear and we have a wonderful time playing and singing our favorites (which is just about every one!). I thought these might be just 'simple' tunes but they're full, pleasing sounding songs that are a joy to play and hear. I rated the difficulty as intermediate/advanced because I have not been playing the piano for very long and some of the chords were difficult for me at first; however the more I play the easier it gets. If you've been playing for a while, this book would probably be easier for you. I'm glad I added this book to my collection! 42 of 84 people found this review helpful.